An enormous and still-growing sinkhole that has led a family to evacuate their Florida home is now inching closer toward swallowing their house, raising concern among neighbors that they will also have to flee the area. The Lambro family awoke Thursday morning to find their Windmere, Fla., backyard gone. The sinkhole, which has already swallowed four trees and a hammock, has now grown to at least 100 feet wide and 50 feet deep. "It's scary to even think about it," Lou Lambro said. "When we got outside, it was just dropping into the hole. It looked like an avalanche in some ways. I'd said, 'It would be nice to have a pool, it's such a pretty view back there,' but I didn't want this. That's a little too deep." Sinkholes occur when ground water builds up and dissolves minerals into the earth, creating a hole underground that eventually becomes so large that the land on top caves in. 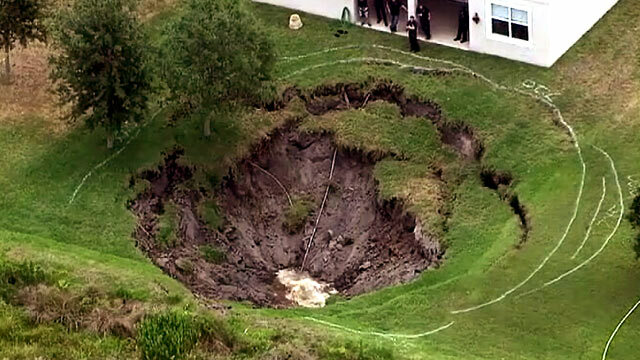 Sinkholes have been known to run more than 100 feet deep. Large sinkholes have been a disruptive menace across North America in the past decade. In 2009, a Dallas sinkhole spread 600 feet wide, swallowing trailers, oil equipment and telephone poles. Another sinkhole in Deltona, Fla., in 2004 devoured homes in its path, stretching to 225 feet. The same year in Baltimore, a mother and daughter driving to the mall ended up in a 20-foot sinkhole. They were lucky to survive. And in Quebec in 2010, the Prefontaines, a family of four, died when their house was swallowed up by a sinkhole while they were watching a Stanley Cup playoff game. That latter incident is why families such as the Lambros got out of their home so quickly and others might follow. "We just bought a house last year in the neighborhood, so that was our concern," neighbor Kim Holock said, with her husband Andrew wondering, "Yeah is our house going to fall in the sinkhole, too?" +Guatemala City Sinkhole: How Did It Happen?